What began as the dream of one man, Jim Rancourt, Ph.D., has developed into a legacy of the very best in polymer testing. Today, we are thrilled to share the exciting news that we are welcoming a new chapter in the Polymer Solutions story. 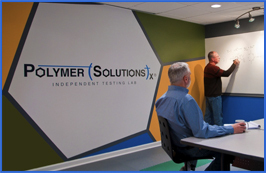 Polymer Solutions has been acquired by SGS, the world’s leading inspection, verification, testing and certification company. SGS is recognized as the global benchmark for quality and integrity. With more than 95,000 employees, SGS operates a network of over 2,400 offices and laboratories around the world. We are excited to enter this new chapter together with the people who have been a part of our story thus far. Without our wonderful clients, we would not be here. Their trust in our ability to deliver great science, each and every day, has propelled our success forward. Speaking of special people, this landmark moment would not have been possible without our exceptional staff of brilliant scientists. Each day they apply great science in the pursuit of reliable data to solve the toughest of challenges–for clients who must be sure. We will continue to operate from our state-of-the-art testing lab, located in Christiansburg, Virginia. “The company, now known as SGS – Polymer Solutions Incorporated, will continue to operate in and contribute to the business community of the New River Valley, the beautiful place we are proud to call home,” said Jim. Additionally, the team you have come to know and love will remain intact–although you can expect additions as we grow! Jim, is now our Technical Director and the former CEO of Polymer Solutions, Cynthia Rancourt, will remain on staff as General Manager of SGS-PSI. So what can you expect? You can expect our team to continue our commitment to stay curious as we pursue great science. You can expect our unwavering devotion to quality assurance to remain. And you can expect increased growth as we proudly integrate into the network of SGS laboratories and welcome all the exciting opportunities that represents. Next Post: In or On the Filet?